It’s Wednesday, which is the day for Smartsaver! Vancouver is pretty expensive most of the times, but you can save money! Coming months will be full of sports. FC Whitecaps already started their season and the BC Lions will start soon! If you want to save money on the tickets of the games then there are two options. First of all, Discover Canada Tours and Westtrek offer discounted tickets for almost all games. Secondly, if you go to the Tourism Vancouver Visitors’ Centre on the day of the game you can also save money! They offer “ Tickets Tonight”, which are half-priced tickets on sports games that evening. Now that the weather is getting better it is time to do some travelling! Boltbus is a bus company which can take you to lots of places in Canada. The bus company offers $1 tickets, but these tickets are really hard to get though. They offer at least one $1 ticket for every trip that they offer. However, the tickets are sold randomly and mostly within the first seats sold. So if you want to get a $1 ticket you have to be on top of their schedule to even have a chance. Also as the weather is getting better go do free activities in the city! Hiking in one of the parks, going to the beaches or walk through the neighbourhoods of Vancouver can be lots of fun and is free! Hope to see all of you guys tonight at PuB NiGHT! 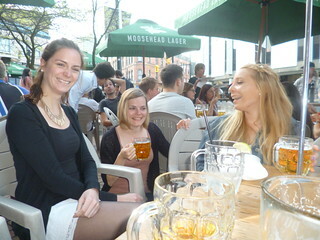 Yesterday was such a beautiful day that ended for most of you at the Cambie for our weekly pub night. However before we went down to the Cambie some of us went to the dance practice. At 5.30pm we gather in front of the Art Gallery for the dance practice with Lee. We were around 25 people, all excited to get our dance moves on. After we had our “dance-meeting”, Lee put on the music and the show was on. We did two rehearsals before we want a dance-off were you could win two backstreet boys tickets. 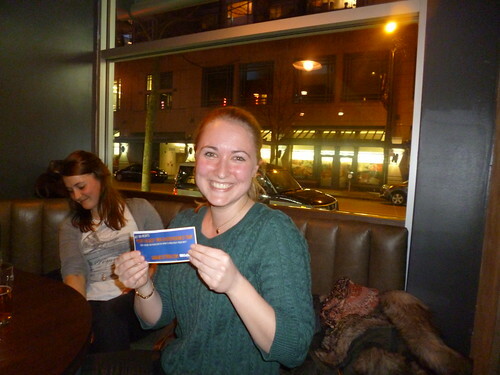 Our own Crazy Alex was the lucky winner of the tickets! Congrats to you. For those who weren’t at the rehearsal, I hope you practiced at home before the big day! Also a video will be soon released of the rehearsal. After the rehearsal we went down to the Cambie for our weekly pub night. 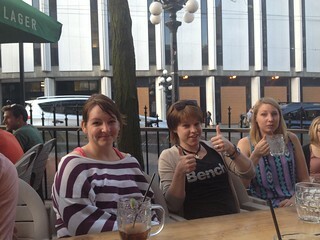 We were lucky enough the get a table outside and to enjoy the warm weather. After the dance practice we were of course hungry so we ordered some nice burgers with fries (btw, there are pretty cheap $9). Since the sun was setting down, it became a bit fresher outside so we went inside for some more drinks. We hope you all will join us for the Flashmob! It will be a fun experience and something to tell your friends & family about back home. Here is a video on how to learn the music and if you click here there is even more information! To get you even more in the mood for the Rockies Trip in April, we have a short movie about the Rockies and what to except. Over the years we interviewed many candidates about their stay in Canada and only good things were said about the rockies, read it yourself. I went to an amazing Rockies Trip. That was one of the best trips I have ever done and I only can suggest everybody to attend the next one in April! I arrived Thursday Night and went straight to the Rockies on Friday morning. The program was awesome, and for me was it the perfect chance to meet people right away. Well I think these testimonials say more than enough! Click here for more information about the trip and do not forget to stop by the office to sign up. If you want you can also pay on one of our pub nights or on friday at the Latin dinner. See you at the Latin Dinner on Friday! Yesterday it was time to meet for a after-whistler-beer and a pre-rockies-beer. Also a great discount on the rockies trip was given away to the winner of the quarters tournament and some other nice prizes were won. We met at the Bismarck where we were welcomed with free nachos and 3$ beer, what else do you want? Some of us ordered food and once everyone was finished eating we started the quarters tournament with Lesley from Westtrek. Pairs played against each other and the winner went trough to the next round. In the finals Fredrikke played agains Mohammed and after some intense moments Fredrikke won the $50 discount for the Rockies trip. However Mohammed did not go empty handed he won a big bus tickets for two days. 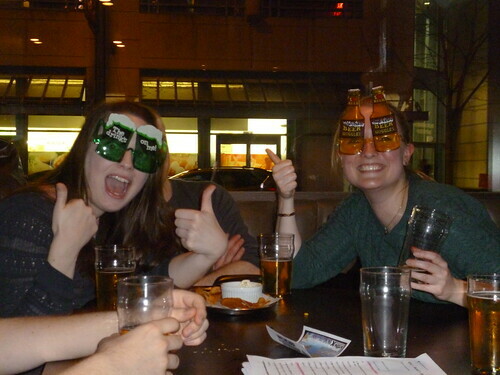 After everyone was calmed down and has some more drink we started our quiz. 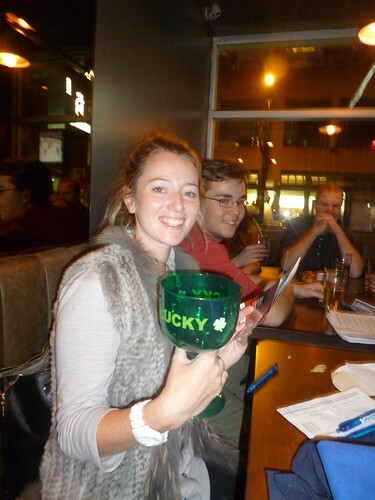 Charlotte was the winner of the quiz and won a big bus ticket for two days and a very green lucky cup. Claudia and Fredrikke won some great sunglasses and Lisa won a nice INTERNeX shirt. See you at our next pub night or at the Giants game on Friday! 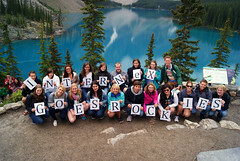 INTERNeX Goes Rockies Summer 2013 Edition: More info! The first week of July is almost gone.. This means, we have just 4 more weeks until the big Rocky Mountains trip! We will be going to the Rockies during the long weekend of August. We are leaving on Friday August 2nd and we will arrive back in Vancouver on August 5th at night. We will go with the party bus.. This means that there is free champagne for the girls onboard! We will leave Vancouver around 7am on friday morning. After the bus departed we will make stops in Hope and Kamloops. Our first night will be in Valemount. The next day we will travel to the popular Rockies resort: Banff, in Alberta. 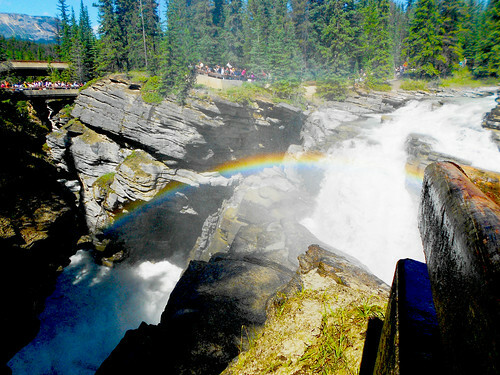 During this day we make stops at Jasper, Athabasca Falls, Mt. 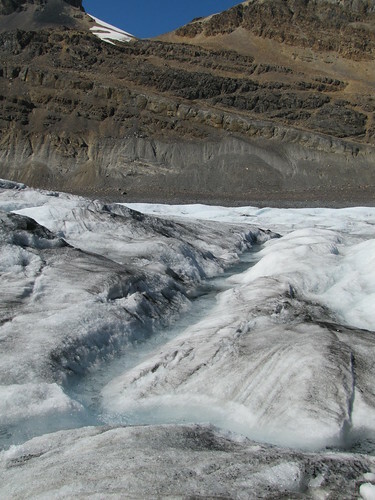 Robson and the famous Columbia Icefields. After a long day of sightseeing we have entrance to the best party places in Banff! The next morning we will have a walk through the city of Banff. 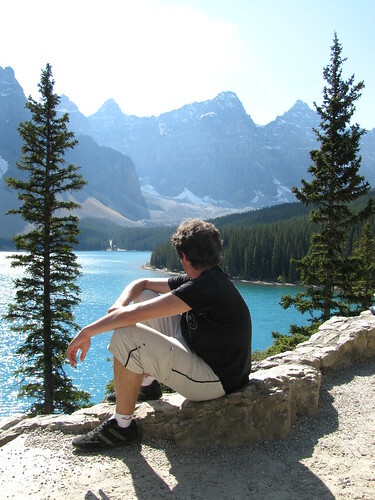 After that we checkout en go too the famous and spectacular Lake Louise. If you want you can rent a canoe or walk around the lake. If you like Lake Louise, you will definitely like Lake Moraine. This light blue colored lake is stunning for everybody. From here we will continue our journey through the Rockies to the city of Golden. After a good night of sleep we will have a breakfast together. Today we will drive back to Vancouver but first we will drive through lots of National Parks. We make stops at awesome places and around 7:30 we will be back in Vancouver after 4 days of FUN. On top of every thing we get to do (all the sightseeing, activities) there will be awesome things to do at night like clubbing to campfire party! For INTERNeX members it is just $355 and for friends of INTERNeX members: $365. This price includes the whole tour with an awesome guide, ALL transportation in a deluxe coach bus, park fees & tips, 2 breakfasts, 2 Canadian BBQ dinners FREE entrance to club, and a End of tour PARTY at Camp West Trek! You MUST come by the INTERNeX Office to pay, or give them to me personally during pub nights (cash only). If you have more questions or concerns, ask me during our pub nights or at our other weekly activities. Other option is to come by to our office! Hope you all can make it, it’s going to be amazing! Have a great weekend!